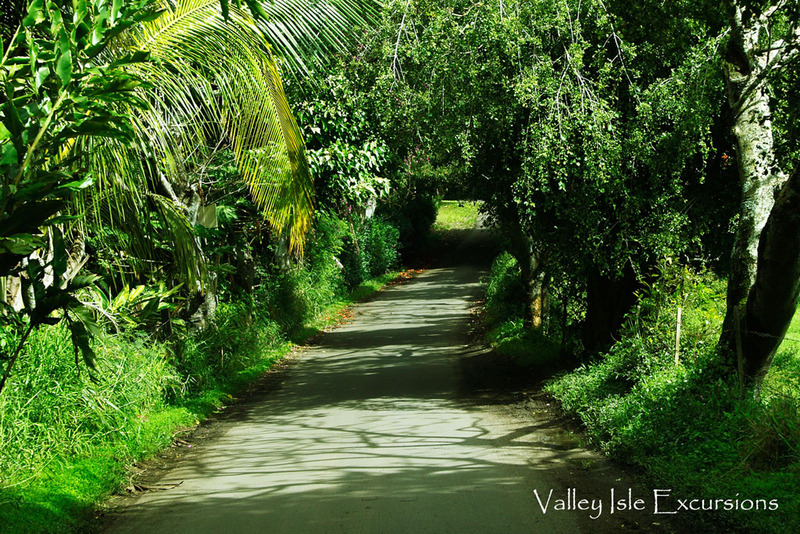 It’s easy to drive the road to Hana and see all the beauty along the way, but it’s hard to imagine what it was like living here in ancient times. I’ve been on all kinds of tours all over the world. I enjoy them because as a photographer and writer, it’s wonderful to have a guide to not only tell the stories of the land and people but to have someone to ask questions. It often spurs my own imagination and gives me great research tips and things to track down later. Many people on vacation often miss out on this information when they drive the road to Hana themselves. They think in mainland terms such as “when we get to Hana we’ll stop and have lunch”, or “it’s only like 30 miles to Hana, we’ll be there in no time”. Unfortunately, hours later when they arrive motion sick and dizzy from the winding road they realize Hana is a small town, I mean really small! Driving through town to Hana bay is about a 2 minute drive. But as you round the corner and see the canoes on the beach and the park pavilions with their concrete picnic tables don’t let the seemingly tranquil bay fool you. At the far end of the bay where the boat dock is, look up to your right at the large hill sitting right on the bay. This is Kau’iki Hill, and is a famous cornerstone in the history of the entire Hawaiian Island chain. In ancient Hawaii, Hana was an area favored by the Alii (royalty) and was the seat of power for the entire island. One of these kings, who was of the great Piilani family of Maui chiefs*, commissioned a road be built around the whole island. It took this king most of his lifetime and that of his two sons to finish it, but it united the villages and chiefs of Maui, and made this island one of the most powerful of all the islands. So powerful in fact, that it was a major goal of Kamehameha to conquer it. Over the centuries, stories have evolved which explain that Hana was attacked at least 4 times by invaders from the big island*. This area changed hands with Hawaii chiefs several times and these stories of legendary battles were passed down for generations through chants. The fighting skill of the Maui warriors was well known on the Big Island, and they were well aware of the difficulty of taking Kau’iki Hill. Kua’iki Hill could be seen from ocean going canoes and was a landmark for people coming as far away as the island of Kauai. The chiefs and warriors of Hana were fierce fighters and many chants tell the tale of battles that raged from Kaupo to Nahiku, but over the centuries it was known that the fortified hill of Kua’iki was the last stand for defending Maui Chiefs*. Maui for years, but finally achieved it himself in what is estimated to be the 1790’s. It took a fleet of 1000 canoes carrying an estimated 100 warriors each*. This invading fleet of canoes filled every bay from Wainapanapa to Kipahulu. The battles lasted for months and the Maui warriors beat these forces back several times. It is said that the warriors of Hana had a unique style of warfare in which they used slings and stones which enabled them to damage and even sink canoes from shore. But the sheer numbers of invaders was too much to overcome, and the people fell back to their fortified fortress of Kau’iki Hill. Even though it was well provisioned with food, spears and stones to throw down upon advancing fighters, Kamehameha found a weakness. Freshwater springs existed on the eastern flank of the hill, and one of his trusted commanders found it and destroyed it in the dark of night. Eventually the hill was surrendered and Kamehameha moved on to battle the last of Maui’s chiefs in Iao Valley, where the waters ran red with the blood of so many killed. Today Hana is one of the most peaceful and friendly places on Maui. It’s beauty is heavenly, and this is how it should be experienced, but keep in mind that this beauty was fiercely fought for in ancient Hawaii, so please respect this hallowed ground and tread lightly. Oh, and take your time and enjoy it, because it really is the land of royalty. *** The Laboral Daily Lunch menu is 19 Euros and the Executive carte is 29 Euros. Mar: Tell us about your culinary philosophy? Chef Pablo: As a restaurateur and working Chef, a place where my wife Ana and I want to go. Dynamic. Traditional Spanish combining evolutionary market, however, our signature favorites with international touches. For example: Ceviche which is Peruvian however, with Galician crevettes (carabineros) and Steak Tartar served with Cassava chips and a mint cream for dipping. Mar: Could you tell us, how does La Galerna translate into English? Chef Pablo: The northwest winds of Galicia follow hand in hand with the ebb and tide. Chef Pablo: Firstly, since I was ten years old, my grandmother and my mother. Then, fast forward, Consultant and Chef Xavier Pellicer of Restaurant Can Fabes in Celoni, Barcelona. Mar: The product, raw materials? Chef Pablo: I was born in Madrid, however, in parallel I was raised in La Coruña, Galicia, in northwestern Spain, so I have always been influenced by the sea and its tenants, fish, seafood and shellfish, the kings of the table, the delicateness, a challenge. Furthermore, it started in Galicia, my grandmother and my mother. My restaurant shares family favourites in a carte that is from the lands which they hail from with a touch of evolution without changing the flavors worthy of their own individual properties. Mar: Goals 2010 – 2011? Chef Pablo: We opened La Galerna on the 30th of December 2010, and thus, are happily satisfied and returning customers with word of mouth recommendations. Mar: Both you and Ana speak proficiency level English. Where have you both studied? Chef Pablo: We lived in Riverside, California for 10 years. Mar: How did the two of you meet? Chef Pablo: We fell in love on a plane getting ready to do a parachute jump. Mar: This is quite a recipe! Opening up a 40-seat restaurant is a huge commitment during hard economic times, says, Chef Pablo of Restaurant La Galerna de Pablo, located 75 metres from the well known Quevedo Plaza of Madrid. We make less money than restaurants that turn more tables however, we love coming to work, for this is our second home. vegetables, for example: tomatoes, carrots and cabbage. (This recipe calls for black beans often called turtle beans). 2) After two hours, add the two varieties of sausages and cook ½ hour more. Hotel InterContinental Madrid – An everlasting and growing five star luxury hotel and our privileged proposal regarding the 21st millennium. The Hotel InterContinental Madrid is profoundly steeped in history. In the 18th century, the property was purchased by Marqués de Mérito and he had the palace reconstructed as a spectacular palatial estate. Implementing his ideas, D. Luis Feluchi decided at the end of the 1940s to keep and maintain the chimney and fireplace in the meeting room, TOLEDO, which is made of Carrara marble. You can still find the doors and LA PLACITA, the entrance for horse drawn carriages, also in their original forms. Pointing out the main characteristics of the impeccable building, the elaborately sculptured frieze in the ALBÉNIZ MEETING ROOM, created by sculptor Don José Planes as well as the floor and the marble limestone columns in this conference room and also the main lobby. The artworks are complimented by decorative elements such as the watercolors signed by Don José Caballero, Don Antonio Arias and Don Álvaro Delgado. Furthermore, inside the building you can relax in its´ magnificent garden where you shall also find a waterfall and the fountain built by sculptor Don Ángel Ferrant. The Intercontinental Hotel Madrid had begun to become very popular in the early 1950s for the Hollywood stars and established itself as the first international hotel in Madrid. It was the foreign residence of many renowned artists during the 1950s film shoots, for example: Ava Gardner, Frank Sinatra and Elizabeth Taylor. Additionally, chosen by many other well known performing artists including, Mia Farrow who made the hotel her home while abroad, the glorious Zsa Zsa Gabor, Sophia Loren, Gina Lollobrigida, Tony Curtis, Robert Mitchum, Luis Mariano, Gary Cooper and Charleston Heston. The 3 day opening festivities took place at the same time the United States of America, Spain and the city of Madrid signed a contract for the Madrid establishment to be the place in which performers and artists would have their very own Madrid meeting point. It had become the headquarters of Hollywood´s fashionable and the elite. The prestigious Hotel Inter Continental is a 5 star luxury hotel with one of the highest brand ratings for its´reputation without leaving out a single detail and catering to the luxury lifestyle in Madrid. Situated in Madrid´s Financial District in the cultural heart of the Capital, Paseo de La Castellana, it offers impeccable services and facilities to satisfy and fulfill all the wishes of our guests. The technology in our rooms and suites, meeting rooms and public areas are state of the art. Here, you can find the spectacular lobby, the central rotunda, with an elegantly luminious dome ceiling and a wonderful view of the splendid garden. It is a breathtakingly beautiful location to enjoy a coffee, tea or wine and / or meet up with friends and business associates. One can also relax in the Bar 49, El Café, and / or the hotel´s first class preferred Restaurant, El Jardín which specialises in Mediterranean cuisine and the delicacies of the traditional and modern Capital of Madrid. The four new Presidential suites and the Royal Suite have been incorporated into this Madrid based establishment and thus, it is a unique offer for luxury accommodation compatible to the cosmopolitan style of this Capital and fashionably glamourous city. At present, the hotel contains 302 rooms due to the latest suites. You can find 141 Superior rooms, 29 Executive rooms, 99 Club rooms, 18 Suites, 7 Ambassador suites, 7 Presidential suites and one Royal Suite to enjoy your stay with us. Additionally, there are 5 non-smoking floors. Laundry, Vale service, air conditioning and heating with individual control, T.V. satellite, pay T.V. possible, AM / FM radio, alarm clock, telephone, answering machine, Minibar, smoke detectors, hair dryer, bathrobe and a security safe for your valuables and especially created for your laptop or netbook. There are smoke detectors in the common and private areas throughout the hotel, fire estinguishers in the public areas, rooms and meeting rooms and Emergency lighting in the Public areas. Information about emergencies and the Emergency Plan for evacuation routes are located inside the rooms and in all public areas. There is 24 hour security and Camera Surveillance in the public areas and last but not least, First Aid. panoramic views of the famed Paseo de La Castellana and beyond. All 17 meeting rooms illuminate Madrid´s lovely natural daylight. Three of them are adequate for private lunches. ( Cibeles, Neptuno and Madrid Meeting Rooms ). Special Conditions: The Albéniz Ballroom has the highest ceiling in all of Madrid´s hotels and is very appropriate for Banquets and all types of conventions and events. Epicurism: Both International and Mediterranean cuisines and the national dish of Spain, called Cocido Madrileño ( pot au fè signifying Dutch Oven on the fire, a cocoction of slow cooking on the flame and / or Madrid Stew ). It is the perfect locations to celebrate your family and commercial events. Our reliable and highly qualified team assist you during your event and caringly solve all your problems you may encounter, immediately. We are delighted to plan your wedding in every detail with the newsest technology and all the services you require on your special day. We have several facilities suited to your individualised needs. Sophisticated yet family oriented atmosphere. Perfect to enjoy a nice Sunday especially for couples, friends and family. Taking the courage of a Great Company, The InterContinental Hotel Group, with more than 60 years of experience, the renowned hotel brand, InterContinental Hotels & Resorts has established more than 150 hotels in up to 60 countries worldwide. We, the InterContinental believe that excellent service, quality and emphasizing its most important element, the guest, and to insure the interests of the clients. Our desire is to help our distinguished guests to benefit from every moment of their stay. Independent of the destination one selects, our aim is to create a new lifestyle in the luxury hotel segment. We wish to share our knowledge with you so that you can experience an extraordinaire and memorable stay which brightens up your life and opens your horizons. Online InterContinental allocates more information and the availability of online booking. On www.ichotelsgroup.com . You can find all the information about our various locations and on www.priorityclub.com , you shall be informed about our Priority Club Rewards and Benefits Programme. "Criadillas" AKA: Rocky Mountain Oysters or Potatoes? We’re crazy for criadillas! There are two types of criadillas in Spain, one is flora and one is fauna. Let’s start with the fauna first. Spanish bulls are known for their fierceness in the ring and their testicles are fantastic when done up in the fryer! Affectionately known in the USA as “bull’s balls” or “rocky mountain oysters”, in Spain criadillas, also called huevos de toro (“bull’s eggs”), are a delicacy, albeit an unusual one. They are rumoured to give the male that consumes them superior performance in the bedroom! Fortunately this delicacy is first removed from the bull at slaughter and later pounded, floured, spiced and fried and finally end up as an hors d’oeuvre with a perfect cocktail sauce to compliment. They share the same name. The second type is a Peruvian potato variety affectionately called criadillas that made it’s way to Europe in the 1500’s! Spain is known the world over for it’s numerous varieties of potatoes. This fact probably, at least partially, explains why five of the world’s top ten chefs are to be found in Spain. The spuds known as criadillas are no stranger to the cuisine-conscious Spaniards and have an amazing texture which is used as a foundation for several meat and fish dishes. They are versatile, creamy and coveted amongst the European haute cuisine crowd. We’re in love with meaty, mild and magnificent mushrooms! Packed with vitamins and minerals these fungi are fabulous for grilling or frying up in the cast iron. Wonderful with roasts and in sauces, these also do fish dishes proud as well. Mixed in with hamburger for that extra special something in the recipe, the Boletus not only does the body good, it tastes good as well. There has been an ongoing love affair with the Boletus in Europe, so much so that many countries have given it their own special nick name. Cepes in France, byelii-greeb in Russia, steinpilz in Germany and porcini in Italy. Like a member of the family the byelii-greeb saved many a Russian during the war, giving them a nutritious foundation food to keep them alive when none other was available. Today boletus has about 100 types and most are considered a gourmet mushroom. It likes to grow under spruces, and other conifers as well as hardwoods, sprouting up through the needles after about ten days of rain. In the Northern Hemisphere this usually occurs in September or October. This culinary ‘shroom is unique in that it doesn’t have gills underneath but pores which cause it to look as if it’s been poked repeatedly with a large pin. These pores should not get wet when cleaning the mushroom as they act as a sponge and take on water. It should be noted that most are edible, except for the ones with red pores. These are considered toxic and should not be consumed.